How to Get from Lisbon Airport to Obidos? Travelling to Portugal and passing by Obidos? Your first stop will be Lisbon airport. Once there you have to choose a ground transportation to get to Obidos. Catching a Lisbon public bus or train aren’t a reliable option because you will be carrying your luggage around all day. If you want to avoid all this worries your best option is to book online with us a private Lisbon airport transfer to Obidos. Professional service for small to large groups. Select Obidos as your transfer destination area and provide us with flight details, Obidos accommodation address and contact. We automatically process your request for transport availability to Obidos and send a booking voucher with your transfer confirmation in a matter of seconds. At Lisbon Airport arrivals terminal a friendly driver will be waiting for you next to a placard with our website logo. For the return transfer we will pick you up from the same address in Obidos. And remember, you can always pay later to the driver for both your arrival and return Obidos transfer. How far is Obidos from Lisbon Airport? How much will it cost? How long? The travel distance between Lisbon Airport and Obidos is 90Km and transfer time takes approximatly 60mins under normal traffic conditions. Looking for an easy, fast, affordable and hassle free alternative transport to Obidos? We do provide taxi transfers service from Lisbon airport or Lisbon hotel to Obidos. You will have a friendly driver waiting for you at the arranged location, he will assist you with all the necessary logistics and guide you to your assigned transfer which may vary from an executive saloon or estate car for up to 4 passengers, a modern people carrier van or mini-bus up to 16 passengers or a large bus up to 27 passengers. Obidos is a small well preserved medieval town located at 81km north of Lisbon. While walking across beautiful narrow streets you’ll notice the gothic, the renaissance and the baroque architecture. 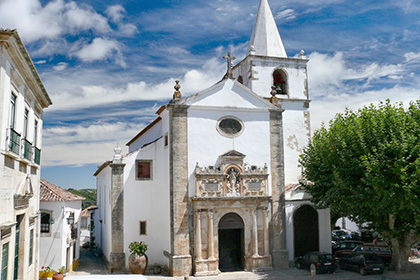 Monuments, museums, art galleries, all places where you can dig deep into the Obidos history: Rua Direita (main street), Lord Jesus of the Stone Sanctuary, Town Gate, Municipal Museum and Parish Museum are just a few places. All year there are lots of activities and festivals to visit: Obidos Christmas Town, Chocolate Festival, Medieval Fair, International Piano Masterclasses, Opera Festival, Contemporary Art Month. Our private transfer service will transport you directly to and from any hotel, resort or private holiday villas/apartments in Obidos area: Bom Sucesso - Design Resort, Leisure and Golf, Pousada do Castelo, Hotel Real de Obidos. Browse through our website and take a look at our full list of taxi transfers fares & prices. Pre-book a taxi transfers from Lisbon airport to Obidos or see all the covered locations.